2 trains, 1 plane, and 1 car ride later, I’m here in Sonoma, California! The sun is still warm as if clinging to the last days of summer, but the air is charged with a brisk hint of fall. After an extraordinarily long wait for baggage at SFO, I took the convenient “AirTrain” to pick up my rental car. The cunning lady at the counter managed to sell me on a $7 a day upgrade to an SUV. What she neglected to mention is how much gas this thing drinks. To add insult to injury, there’s a large MPG display often reading in the low single digits to remind you how bad the gas mileage is. As I headed across the Bay and up to Sonoma, I was met by the familiar sight of fog around the Golden Gate bridge. But about half-way across, I felt like an airplane emerging above the clouds as the fog suddenly thinned, then disappeared. 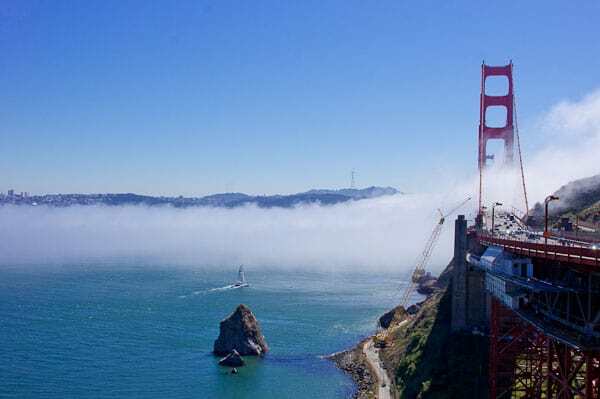 Looking back towards the city, it was as if the Pacific side of the bridge was a giant punchbowl filled with dry ice as the fog poured over the lip of the bridge and into the Bay.